January 3 is the national holiday in Burkina Faso when everyone celebrates Anniversary of the 1966 coup d'état, or the Revolution Day. There was an alike holiday that had been celebrated since 1992 and till 2000, but it marked another revolution. The Republic of Upper Volta (the previous name of Burkina Faso) was French colony for a long time and it had to go through different multiple changes to get its independence. 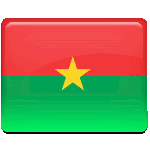 Its first president Maurice Yaméogo declared Burkina Faso to be an independent republic from France on August 5, 1960. But over the next five years Yaméogo's actions (among them prohibition of political parties except his own) caused disapproval among citizens. It led to the nationwide strike driven by syndicates. The Army of Upper Volta decided to seize the power and caused Yaméogo's abdication. In order to avoid the civil war Yaméogo resigned on January 3, 1966. The constitution was suspended, the National Assembly dissolved and the Army controlled country for four years until 1970.